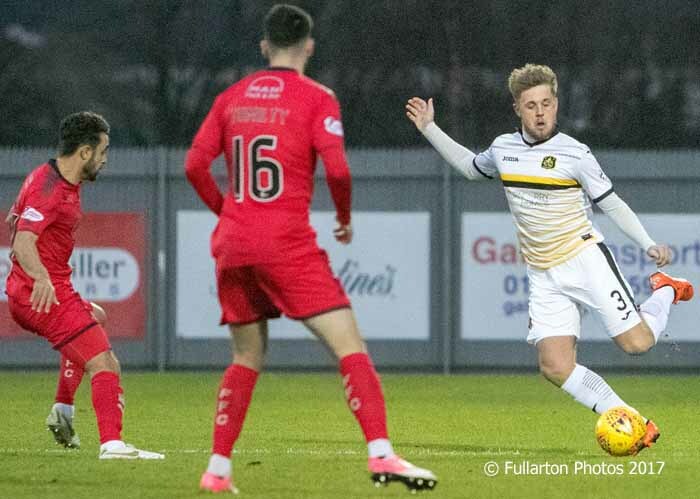 WHAT seemed a serious ankle injury for Dumbarton defender Chris McLaughlin overshadowed a tense draw with Falkirk at the YOUR Radio FM103 Stadium. Play was held up for eight minutes as 'Boomer' was treated by the club doctor, physios and ned Cross First Aiders before being stretchered off and taken to hospital. Sons claimed another point in their Ladbrokes Championship campaign after the 0-0 draw.=. The early pressure came from the visitors, with Sons keeper Scott Gallacher called into action several times in the first 20 minutes to make important blocks. For Sons there were half chances for David Wilson and Dimitrios Froxylias, in what was a fairly even but wet and windy first half overall. Dumbarton came out with all to play for after the break. On 50 minutes Craig Barr had the ball in the net, but it was ruled out for a foul on Falkirk goalie Robbie Mutch. On 64 minutes Chris McLaughlin (pictured earlier in the game) took a nasty fall and had to be treated before being stretchered off to applause from both sets of fans. The game opened up in the later stages, but was also interrupted by a number of strong challenges as both sides looked for a late winner. In the end it was not to be, with Sons heading into their Boxing Day home match against Livingston on the back of a point that keeps them clear of the Bairns and Brechin at the foot of the SPFL Championship. The Sonstrust Man of the Match was Dumbarton keeper Scott Gallacher.